Who wouldn't love a fun night out with friends to break up all the commitments and stress of the holiday season? Read all the way to the end for a chance to win tickets to a very funny show for you and three friends! 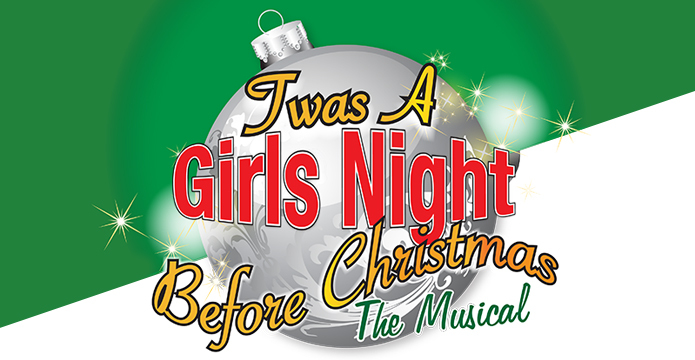 Twas A Girls Night Before Christmas: The Musical will be playing at the lovely City Theater in Detroit from December 14 - 17, 2017. This hilarious show features five ladies gathering for a night on the town to laugh, cry, and just let their hair down during the craziest of times - the holidays! From Olympia Entertainment: "This musical is guaranteed to resonate with anyone who has survived the holiday season, from the long visits with in-laws to the overcrowded malls. ‘Twas A Girls Night Before Christmas: The Musical will feature the touching and hilarious writing by Roche that has entertained audiences worldwide, with classic Christmas songs and contemporary Hits that will have everyone singing and dancing along." Tickets can be purchased at OlympiaEntertainment.com, the Fox Theatre Box Office and the Little Caesars Arena XFINITY Box Office (both without service charge) and Ticketmaster.com. BUT you have a chance to win four tickets to the December 14 performance! Enter using the widget below. I will contact the winner on November 28. If I don't receive a response, a new winner will be drawn on November 29. I received tickets to the show for promoting, but all opinions are my own. This looks like a lot of fun. The perfect show for a girls night out with friends. I think we all get a little stressed around the holidays. Tis the time for holiday themed shows! Winning these tickets sound like they'd make for a great girls night out for some lucky ladies. Show and drinks is a perfect girls night out! I enjoy seeing a movie or going out painting for girls night out. A girls night out doesn't need to be costly. Just a coffee and lots of laughter. I think this would be a wonderful gno! We especially love to LAUGH a lot and we love live plays and musicals and things like that so this would be perfect and it would be extra perfect because my daughters are also my friends and they are adults, and or maybe my awesome sister in law and one and only adult niece could come with me, and/or, my cousin who grew up with me as a best friend/like a sister, heck honestly even my HUSBAND would LOVE to go, he's SO MUCH FUN not to mention he is literally my BFF!!!! AND on top of all of that, my 50th birthday is Christmas Day and this would be SUCH a fun way to celebrate with several of my loved ones! Thank you for the chance. Such a fun giveaway. Would love to win some tickets too! Granddaughter turns 21 on December 14th. This would be perfect for her and her girl friends. This looks so cute! I can't go on the 14th, but will have to check on the other dates, it would be a fun girls night out! This would be great! Thanks for the opportunity honey! This would be perfect for the girls night out my friends and I have been trying to plan!